The 2017 election saw a total of 208 female MPs appointed. This is an improvement on the 191 elected in 2015, but still does not offer accurate representation to the 32 million women living in the UK. Men in parliament outnumber women by almost three to one. This means that the issues that directly impact the everyday lives of women are less likely to be brought up and discussed in parliament, let alone dealt with effectively. It means that women’s voices are less likely to be heard or taken seriously. Twelve women were elected to parliament between 2017 and 2015. At this rate, it will be fifty years before women are represented equally in government. Studies have shown that women are half as likely as men to consider a career in politics thanks to the lack of female political role models. 50:50 Parliament was founded in 2013 by Frances Scott to generate a movement that would challenge and change this. The campaign encourages both women and men to fight for fair representation and supports women aiming to get involved in politics. Since the petition was first launched, over 52,000 people have signed calling for a balanced parliament that accurately reflects contemporary society. Regardless of party affiliation, 50:50 Parliament believes that equal representation of women in government would improve the experience of women in the UK. In November 2016, the #AskHerToStand campaign was launched in time to encourage women to pursue seats in parliament in the 2017 election. The organisation plans to continue this campaign until 50% of MPs are women. 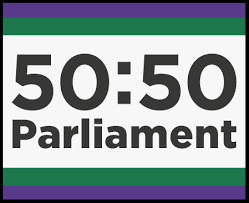 50:50 Parliament provides women with political aspirations with a simple six step guide to becoming an MP and offers them support along every step of the way.